I'm actually going to wait until the official trailer drops this Thursday (the most-likely date) before I answer that question. In any case, I will say: If we're lucky, we might get a "Developer Diary" video on Taki sometime later as well. Bamco officially uploaded the trailer earlier than I expected! It's up today. And now moving onto your question, purifyweirdshard. It feels amazing to see Taki again, and her default costume looks to be a mix of her SC1 outfit with her half-mask from SC3. I especially like seeing a couple new moves (including one inspired by her destroying a demon in the Intro Movie of Soul Blade/Edge). Yet another character trailer has dropped today. "Tonight, a demon runs wild!" I dunno about the rest of you, but I'm hyped by the bizarre change to his design and his newest moves. 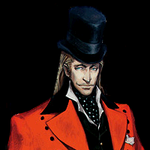 I always liked this guy better in Soulcalibur games than in Tekken. (EDIT): For some odd reason, the video was taken down... so I found another link! Hello Yoshi. Love the new look. This game just keeps getting better. Pardon my ignorance, but how is he very different than his previous incarnations? Hasn't he always had a crazy costume and fought with a banner and katana? Were you also looking for Yoshimitsu in Japanese? Yep. He's always had crazy costumes and that same fighting style. - One change is that he simply looks more "demonic" than ever. He looks less like a masked samurai/ninja-hybrid with a wooden arm, and more like a genuine oni/demon (even though that "face" of his is obviously another mask). - He has a couple new moves where he literally takes [what appears to be] a piece of his opponent's soul out of their body. Pretty sure we've never seen him do that before. - A third change to him, which most people might be talking about, is his personality. He seems more focused on vengeance, and fueling his blade for that purpose (like he originally was in SC1; before he became a heroic outlaw and sought to destroy Soul Edge). purifyweirdshard Oh yeah, definitely. Yoshi's been dubbed in English releases since SC2. Maybe it's because I only remember him still saying wacky, non-English words even when he was dubbed lol. purifyweirdshard "Namu" might as well be Yoshimitsu's catchphrase. With Create-A-Soul, I do wonder if we'll get a mechanical arm equipment. It would be nice to be able to create Zangetsu in SC6 along side Miriam. Another character trailer has dropped today. The Ryukyuan pirate-captain who seeks revenge against the golem Astaroth. Also a long-time traveling companion of Xianghua & Kilik. "Surf's gonna get rough. I'll ride the waves!" It's about time for his reveal, too. A "Sailor's Rest"-esque stage had been teased since Siegfried's reveal. Hey Bruce Lee Maxi! Welcome back, man. Glad to see you still got your swag. BalancedHydra And now that I see his "A Dandy At Sea" title about 17 seconds into the video, I can't help but be reminded of Space Dandy. Maxi's even got an exaggerated pompadour... like Space Dandy. No, this isn't more news about the game. But I've been watching the SoulCalibur subreddit page lately, and I've just noticed a rather interesting topic pop up. I've seen the minor character "Durer" appear in SoulCalibur IV before, but I had no idea about any of these details. He's more of an important character than I was expecting. purifyweirdshard I can understand. I'm slightly miffed that the guy who created that thread isn't at least suggesting that Hilde's moveset should still be in SC6, but I've avoided making the minor complaint. Even if she is "too young" (as is a popular argument against characters on this subreddit, apparently) by this point in time, I still want to see her alongside others in SC6. I think she was fighting/leading in Wolfkrone as young as 13-14, so it's still plausible to me, and of course this game isn't beheld to canon anyway so they could pull some strings if needed.